You Gotta Check this Out, Fun Facts About Corgis! There are two types of Welsh Corgis. There’s the Pembroke Welsh Corgi and the Cardigan Welsh Corgi. They are considered two different breeds, because they come from different ancestors. Their resemblance is a direct result of crossbreeding. The easiest way to distinguish them is by their tails or lack thereof. The Pembroke does not have one and the Cardigan does. At Petland, we have Pembroke Welsh Corgi puppies for sale all the time, check them out here! The Pembroke Welsh Corgi is highly intelligent – no really, they are! They are beyond loyal and willing to please their owner. 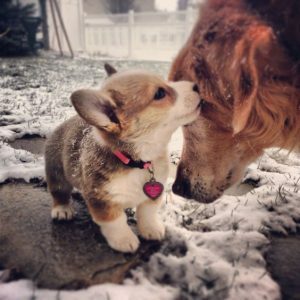 Corgis are extremely active and are great with children. They’re goofy and lovable. Despite their short legs, they are pretty fast runners and require daily exercise. They make excellent watchdogs, partially due to their barking. Specifically, the Pembroke tends to be big time barkers. Many owners have reported that they sometimes try to herd them around the house by nipping at their heels. Once she’s part of your home, she can and should be trained not to do this, despite how cute and funny she may be asserting her natural instincts as a herder! Queen Elizabeth II has owned well over 30 Corgis in her lifetime. Her first male Corgi, named Dookie, was given to her by King George VI, in 1933. A second Corgi named Jane joined the royal family producing a litter of puppies, of which two were kept. The Queen later received another one named Susan for her 18th birthday. This started a royal love affair and Corgis have been in their family ever since. Corgi Means Dwarf Dog or Does It? Research has shown that the origin of the name “Corgi” combines the Welsh word “cor,” which means to watch over or gather. It’s been said that “gi,” is a Welsh word for dog. There are others who say that the word “cor” means dwarf and combine with “gi,” it means dwarf dog, to obviously describe their short and sturdy stature. We must tell you that they are among the top shedding breed of dogs! They tend to shed heavily during the spring and fall seasons. Their coats need to be brushed at the very least 2 – 3 times a week. During shedding seasons, they require daily brushing, lest your furniture and clothing will let you know! At Petland Kennesaw, we have Corgi puppies for sale and most importantly we have those accompanying shedding tools and products! Adding a new puppy or an adult dog in your life or family can bring unfathomable joy to your home. In order for your newest addition to fully thrive and become a hassle free member, learning how to potty train a dog in 7 days is going to be essential. Here at Petland Kennesaw, we’ve put together a potty training guide for you to follow. We want you to keep in mind that these are the initial steps, however to fully housebreak your puppy it can take four to six months of consistency and patience. Firstly, walk your dog at the same specific time every morning. Much like humans, they need to relieve themselves as soon as they wake up. While on your walk, properly monitor them and wait until they go, before you go…back inside! Allow your dog to play or have some free time for an hour. Secondly, you need to create a feeding schedule that you will be able to adhere to realistically. We say “realistically,” because we want you to be sure that what you plan for you’ll be able to actually execute. 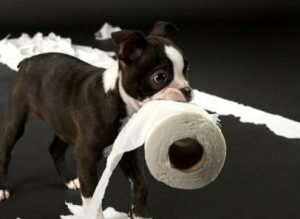 A consistent eating schedule, with no snacks or treats in between meals, is key to establishing a consistent potty routine and will ensure that you learn how to potty train a dog in 7 days. An hour after the first walk, give your puppy something to eat and drink. Watch him carefully after he eats, because some dogs have the urge to go potty immediately after eating. If you notice him sniffing, whining, circling, barking, wandering around the house, or even scratching at the door, scoop him up and go for your second walk! Ideally you should wait 90 minutes before the next walk, but if you detect the aforementioned signs, follow them! You want to make the elimination experience an enjoyable one, so reward your dog for his good behavior by giving him a treat or verbal praise IMMEDIATELY after he’s done his business. Pay attention to where your dog has gone and take him to the exact same spot each time you take him outside. Now it’s back to puppy play time. Allow your dog some free play, but in a closely monitored and enclosed room, such as a kitchen. If you have decided to crate train your puppy while housebreaking, crate him for a consistent number of hours daily. Provide him with toys for entertainment and to prevent boredom, however under no circumstances should food or water be introduced during this time. Remove your puppy from his crate or end free time at a specific time by giving him some food and water. If possible, wait for 90 minutes and then take him outside. When you come back inside, allow him at least 30 minutes of free time before crating him. The next step to learning how to potty train a dog in 7 days is giving your dog food for the third and final time. Feed your dog at 6pm and take him outside within 30 minutes. Now is a great time to allow him to play a bit outside and learn his surroundings. Give him 30 minutes of outdoor or indoor playtime or place him in a crate or closely monitored enclosed area. For the last time of the day, offer your the puppy water at 8pm, however do NOT allow him to drink after 8:15pm. Take him outside within 30 minutes and just as before, give him 30 minutes of playtime or crate time. Before bed, take him outside at 11pm for the last and final time of the day. Ideally crate training him overnight would be best to prevent any late night accidents. Congratulations! You’ve made it and completed a week of learning how to potty train a dog in 7 days. After this full week of consistency, your dog should be advancing towards little to no accidents inside and purposeful eliminations outside. Remember to continue to follow a regimented feeding and potty schedule to further ensure your success. Feel free to contact any of our knowledgeable staff here at Petland for more tips! Here at Petland Kennesaw, We’re Mad About Mastiffs! Mastiffs are massive and there’s no disputing that! Physically, they can be rather intimidating, but we’re here to tell you that despite their huge muscular bodies, one of our Mastiff puppies for sale can be your loving companion! Check out our available puppies page to see all of our Mastiffs for sale! The Mastiff’s history is a little muddled. According to some accounts, Mastiffs, who are also known as Old English Mastiffs, were brought to England by Roman invaders thousands of years ago. Another theory is that Phoenicians brought them to Britain around the same time. What most can agree on is that they’ve been around for thousands of years. Mastiffs were bred in England for more than 2,000 years as sheepherders, guard dogs, police dogs and companions. Like so many other dog breeds, World War II almost annihilated most of the Mastiff puppies for sale. 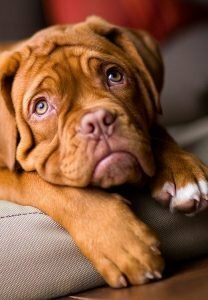 Mastiff lovers in America helped to revive and rejuvenate their existence and their numbers steadily rose all around the world. Today, the Mastiff is one of the most popular breeds in the United States. Opening your home to a massive Mastiff (we just love saying that) is no small feat, especially if you aren’t quite sure if you have the proper amount of space to house one. Let us be clear, they can certainly live in an apartment, so as long as they’re walked and exercised regularly, but they would fair better in larger homes with larger outdoor spaces! They truly make great house pets. Mastiffs very rarely bark or make any noise, sans their snoring snorting! They are gentle giants and you’re likely to come home and find them lazily chilling on the couch catching some zzzzs. They’ll perk up to speak and then retreat. They are regal and have a quiet dignity about them that gently and naturally commands respect. They’re practically unmatched when it comes to the level of protection they provide for families. For thousands of years, they’ve been used as guard dogs. Comically however, they are more likely to scare off would be intruders simply by their sheer size! When you find Mastiff puppies for sale and make your purchase, stock up on some towels as well, because these big boys drool like none other! They’re sweet, but slobbery! While you’re at it, get some air fresheners, too! They’re terribly prone to gassiness. Because of their natural inclination of protection, they need to be properly socialized with both people and animals. If not, they can become fearful of new situations and leery of strangers. Mastiffs have short, smooth coats, but they do shed a lot. Their weights range from 150 to 200 pounds and their lifespan is 7 to 10 years. The Akita is a well known, powerful, and strong breed – so much so it’s a national monument in its native country of Japan. They were so revered that they were exclusively owned by the Imperial family. Feeding and caring for Akita puppies was no small feat. Rituals and ceremonies were involved to include lavish leashes which doubled as status standings for the Akita puppy and its owner. Did you know that back in the day when kids were born, a Japanese family would be gifted a small statue of an Akita, signifying health, happiness, and a long life? They signified spirituality with the Akita. The Akita is a bold, powerful, and protective dog. He is extremely devoted to his family, especially children. He thrives most as an integral family member, which is why he shouldn’t be relegated to being an outside dog, despite their love for the snow. The Akita will instinctively guard their owner’s home, which is one of the reasons they require extensive training. Early and frequent socialization are essential for Akita puppies. Try using positive exposure to various people, places, and things, both at home and in public. They are pretty aloof toward strangers and can be aggressive toward unknown dogs. Akita puppies to adult dogs will require daily exercise. They’ll be happy with a good daily walk or jog, for 30 – 45 minutes. They aren’t known to be a particularly hyperactive dog breed, however they can both climb and dig! If feasible, secure them in a six foot fenced in area when they’re outdoors. 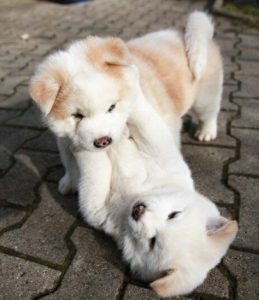 Before the Akita received its official breed name, they were commonly referred to as “snow country dogs.” Akita puppies were bred in snowy, rural, mountainous regions in Japan named Akita and Odate. They served as bear hunters and guard dogs, so their thick double coats protected them from the elements. What’s really neat is that their undercoat is thicker, softer, and shorter than the outer coat. Conversely, their outer coat is really straight and harsh and stands kinda “off the body” thus making them waterproof! Furthermore, it helps to keep ice and snow off of the Akita puppy, while keeping it insulated and warm. What Time is It? Petland Says it’s Time for a Teddy Bear Dog! The teddy bear dog breed is a relatively new type of dogs that was first discovered and introduced in 2000. These designer dogs consist of and is commonly known as the Zuchon or Suchon, which is a cross breed between the Bichon Frise and Shih Tzu. Now, although this is the “technical” definition of the teddy bear dog breed, the name has become synonymous with the hybrid mix of Shih Tzus, Cocker Spaniels, Bichon Frise, Toy Poodles, Daschunds, Maltese, Yorkshire Terriers, and Schnauzers. Regardless of the mix, most of these dogs share the same friendly, sweet, playful dispositions. Their weights range from 11 – 20 pounds. Their coats are fluffy, soft, and shed very little. We’ll highlight three of the most commonly known teddy bear dogs. They’re also known as Shichon, or Tzu Frise, which is the namesake for the teddy bear dog breed. It was coined because of their small size, fluffy coat, large eyes, and general resemblance to a stuffed teddy bear. The Zuchon can be as large as 20 pounds, however they usually weigh between 11 – 15 pounds. This is one of the most popular mixes. 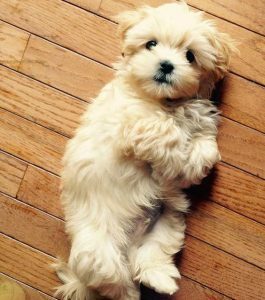 They are the crossbreed between a Maltese and a Shi Tzu and are usually on the smaller side of the teddy bear dog breed, weighing between 9 – 12 pounds. Physically, this adorable bundle has large deep set eyes, floppy big ears, and the “smooshed face” of the Shih Tzu. Pom Pom, as it’s also called, is the smallest of the teddy bear dog breed. They typically weigh between 5 to 7 pounds and their standing height measure 5 to 11 inches. They originated in Germany and were the royal lapdog. Pomeranians have an extravagant double coat that absolutely requires regular brushing. Professional grooming will keep its extremely fluffy coat looking its best. They are family friendly, however they can be a bit jealous and sometimes aggressive towards other dogs. With the proper care, diet, and light exercise they can live up to 16 years! Petland Speaks: Time to Talk About Teacups! Know the facts behind the “Teacup Puppy” buzz, before jumping into ownership of these pint-sized puppers! Teacup puppies are a bit of an anomaly, but we’d argue the cutest ones! You’ve certainly seen them and they’ve been popularized by celebrities worldwide. Allow us to shed some light on teacup puppies. Can’t wait to see our adorable puppies, just click here! The term teacup is the unofficial name associated with extremely small dogs. These dogs can actually fit in a teacup (as puppies)! You may also hear them being referred to as toy dogs or micro dogs. The term is used to describe the size of a tiny puppy. Teacup puppies can be the result of intentional and unintentional breeding and some are runts of the litter. The teacup puppy is not a breed. The term simply references and describes the size of the dog. That’s it! What is the size of teacup puppies? If a dog is considered a teacup, this means their size will typically range from 3 to 4 pounds, at its full grown weight. If the dog is considered micro, they will usually weigh between 2 to 3 pounds at its full grown weight and age. There is no universal or mandatory size, since teacups are not an official breed and are not regulated. Other times, teacup puppies are the result of breeding two very small dogs of a certain breed. What breeds are known to be teacups? 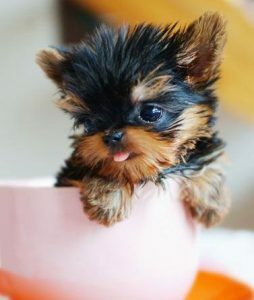 What are the health concerns for teacup puppies? There’s certainly been some controversy surrounding the health of teacup puppies. Many people believe that they are unhealthy, however that is not necessarily the case. This particularly applies to teacups who have been bred irresponsibly. They may experience numerous problems, as with any dog, but truly the thing to be watchful for is making sure they don’t get injured accidentally or don’t eat enough throughout the day. If the teacup puppy has been bred from a healthy line, and from a line that specifically breeds dogs to be small, then they can most assuredly be equally as healthy as any other size dog. Still, though they can lead healthy lives, they do have some common concerns. Most revolve around their extra small organs and subsequent birth complications. Their tiny bladders will make potty training a little more difficult, but at least they’ll leave drops and not puddles! If you’re interested in learning more, our Petland Kennesaw staff are available field your questions anytime! Here at Petland, We Just Love the Wheaten Terrier! We like to spotlight dogs that may not be a common household name and the Soft Coated Wheaten Terrier fits the bill. You’ve probably seen a Soft Coated Wheaten Terrier for sale online or in person, from time to time. The Wheaten Terrier is a fantastic family addition and can be a great companion to children. Early terriers in Ireland were small, farm dogs that alerted the farmers to strangers. They also captured vermin such as mice and hunted badgers and foxes. Surprisingly, little is actually known about the Wheaten’s background or development. We do know that the Irish Kennel Club didn’t recognize the dogs as a breed until 1937. Wheatens made their first appearance in the United States in the 1940s by Lydia Vogel in Massachusetts. Not a lot was done with the Wheatens at that time. They were not bred, nor were there any showings. The American Kennel Club recognized the Soft Coated Wheaten Terrier, in 1973. It currently ranks 59th among the breeds registered by AKC. Short, sturdy, and kinda square accurately summarizes the body of the Wheaten Terrier. Its head is long and rectangular and it’s ears are small and flushed with the top of the skull. They have human-like wide set, almond shaped eyes that are normally brown or reddish brown in color. The body is muscular with a strong back and powerful legs. Their wheat colored coats are soft and silky, which is unlike other Terriers. This dog is unique from others in its breed. 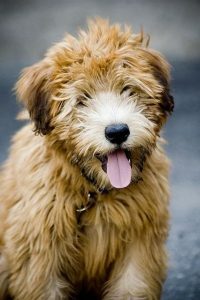 There are vast characteristics between that of the Soft Coated Wheaten Terrier and all other terriers, so much so the differences outweigh the similarities. Should you encounter a Wheaten Terrier for sale and in person, you’ll find them to be extremely gentle. They get along swimmingly with children, cats, dogs, and strangers very well. The most notable commonality to other Terriers is their stubbornness! You may have to spend some a little more time teaching your Wheaten Terrier not to pounce on people! Among other things, one of the most endearing distinctive traits is that they’re much more affectionate and charismatic than most terriers. 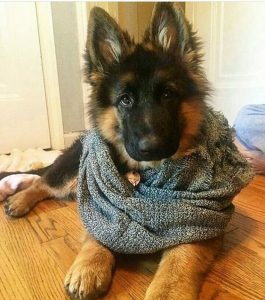 German Shepherd puppies are not only cute and cuddly, they have all the makings of a great companion! OMGee you’ve got a GSD! Congratulations on getting a German Shepherd puppy. They are regal and some one of the most loyal breeds to exist. You chose them for many reasons. FACT: Though they’re cute and little when you first bring them home, GSDs grow and grow and grow. They also require a lot of daily exercise. These fun fellows will take full advantage of an open field. Be prepared for meeting their physical needs by locating local parks where they can run, walk and play. Don’t be afraid to make your GSD your favorite workout partner! TIP: German Shepherd puppies are notoriously known for being destructive little ones. They’ve been given the nickname as German Shredders and this phase can go into their adolescent stages. To help remedy their, let’s call it a “playful period,” crate train them early and keep them well exercised, both physically and mentally. FACT: Be prepared to own a dog who may be smarter than you! They ranked as the third most intelligent dog. They are incredibly alert and eager to please. German Shepherd dogs can be trained to do almost anything. They keep you alert, as they’re seemingly one step ahead of you! TIP: Yet another nickname for German Shep puppies is German Shedders, because they shed. To help with the shedding, keep the diets healthy and invest in some digestible oils. Not only do they promote health coats, they prevent less shedding. Pop over to Petland Kennesaw for de-shedding products and daily maintenance. Jetsetters: Everything You Need to Know Before You Buy a Dog! Just because you travel a lot doesn’t mean that you can’t enjoy being a pet owner! You Have Some Reservations – Once you’ve made your flight travel plans, you also need to call the airline to make a reservation for your dog. There is a limit to the number of pets on each flight, therefore it’s wise to call shortly after your ticket has been purchased. The last thing you want is to show up with your pup and there is no available space. Pay(furry)Pal – Not many things are free in life, including flying with your teacup sized pup. When you buy a dog that takes up little to no space, you expect some “spacial freebies”, right? Well, unless you have a certified emotional support animal, you have to purchase a ticket each way for your dog. These prices range between $100 – $125 and are paid at the check-in counter. There are very few airlines that allow online payments. Watch the Calendar – When you buy a dog, vet visits are common and should be routine. When you are flying with your dog, it is imperative that you read your airline’s pet policy rules. They require a veterinarian certified travel certificate, which includes a vaccination and overall health report. Most airlines require that this certificate be issued 48 -72 hours before the date of travel. Some airlines are rather strict and pay close attention, so be sure to visit your vet within the required timeframe. Crate Comfort – There are tons of cute crates that you can purchase, however not all are in-cabin airline approved. Check the airline’s standards and compare that to the crate you have or plan to purchase. 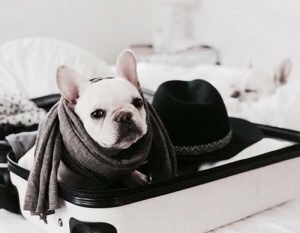 International Travel – In addition to checking the pet policy for your airline, if you are traveling internationally, you also need to familiarize yourself with the pet travel policy per country. The entry and exit processes can be tricky. For instance, leaving the country Colombia, you are required to obtain a vet travel certificate 72 hours before your flight. The second requirement is that you visit one of their airports and obtain a parasite-free health certificate 48 hours before your date of travel. There are many caveats for international travel with your dog. You must research intently. There are lifelong surprises you’ll encounter when you decided to buy a dog on your traveler’s lifestyle. Stop by or contact our Petland Kennesaw location for assistance on purchases and how to prepare for those surprises! A Puppy in Your Apartment: How to Know Which One is Right for You! Perhaps you’re just moving from your parents’ house and getting your own place? Perhaps the roommate life is no longer attractive. You want your own space, but want to share it with perhaps a pet, not someone else. You haven’t decided on what kind, but you have decided to get a puppy for your apartment! They hold the gold star for apartment puppies! English Bulldogs sleep a lot and they’re very quiet when awake. They don’t run a lot nor do they make much noise. Well, they are LOUD snorers, but that’s only heard in your immediately vicinity! They shed, but not excessively. This breed is synonymous with the term couch potato. They have a compact size and low activity, thus not requiring much exercise. They shed a minimal amount and they rarely bark. They are the perfect apartment puppies and can be found at our store all the time! Want to know more about this insta-famous breed, click here!